To those who call themselves Christians, but believe that there are more ways to God - if one reads the Word of God, is there really any doubt? If you say you are a Christian, then you must believe in the Christian scriptures. John 8:24 Therefore I said to you that you will die in your sins; for if you do not believe that I am He, you will die in your sins. Philippians 2:9-11 Therefore God also has highly exalted Him and given Him the name which is above every name, that at the name of Jesus every knee should bow, of those in heaven, and of those on earth, and of those under the earth, and [that] every tongue should confess that Jesus Christ [is] Lord, to the glory of God the Father. Telling someone that they must obey the ten commandments (the Law) is the most dangerous advice. If he thinks he obeys, he is deceived. If he does not obey, he is discouraged. Even attempts to obey for the purpose of pleasing God, not for one's own justification (salvation), is a precarious line one is likely to stumble over. How do you know you are a Christian? Have you been told that you know you are if you love God? What is the love of God? Is it not the foremost commandment which is to love God with all your heart with all your soul and with all your mind? Consequently, love is (merely) the following or the attempt to follow the Ten Commandments. Mormons have some very odd beliefs that are definitely not Christian. The following are Christians who have or are collaborating with Glenn Beck in relation to his faith in his Mormon god from the planet Kolob: (photos, if available, below). 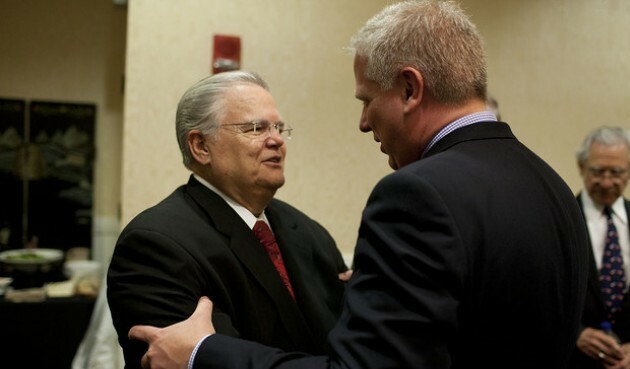 Only those who appear with Glenn Beck or others in relation to their faith are considered for the list. What does the God of the Bible have to do with other gods? Would Elijah or Isaiah converse about God with the priests and followers of Baal, Ashtoreth or Molech? PRT believes something besides a conversation would take place if they met. Kudos to a "big evangelical"! Recently, Mr. Beck described a conversation he had with such an individual who did the right thing. Listen to Beck as he describes the conversation. If only more Christian leaders would do the same, there would be less confusion related to true Christianity and the cult that is Mormonism. 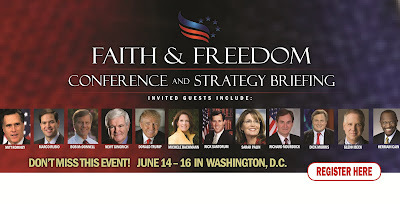 Ravi Zacharias - PRT is saddened to have to include RZIM Ministries in this category. 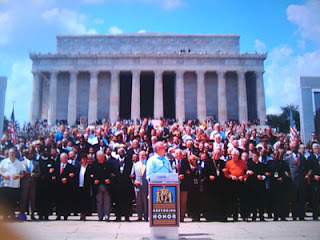 RZIM is a solid organization that does much good throughout the world spreading the Word in many hostile environments. Mr. Zacharias went on Mr. Beck's program to promote his book, Why Suffering? As is the case in most interviews with those of faith, the segment focused on God and faith. There was no mention of the differing faiths the men held. A novice to either of the gentlemen would be led to believe they held a faith in the same god. Mr. Zacharias attempted to explain his appearance on the program to those that may question the wisdom of such a move. PRT believes it fell short. Pastor Mark Driscoll of Mars Hill Church in Seattle. Mr. Driscoll has taken much heat lately for various issues, but none of them stem from the visit in December of 2013 on Glenn Beck's show. Clearly faith was spoken of during the time on the show giving further credence to Beck's cultic false religion. Under God Indivisible It saddens PRT to have to add Under God Indivisible to the list. The Dallas Fort Worth Leadership conference held on July 27, 2012 had so many prominent and well-respected Christians attending. PRT resisted adding them to the listing for some time believing that their guilt was only by association. Glenn Beck's Restoring Love event was happening at the same time, but did not necessarily need to be affiliated with Under God Indivisible. However, that is not the case. 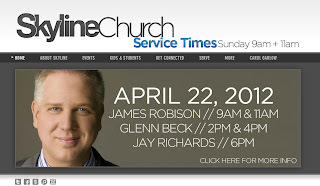 Glenn Beck is a speaker at the conference and it is a prominent event on his schedule. 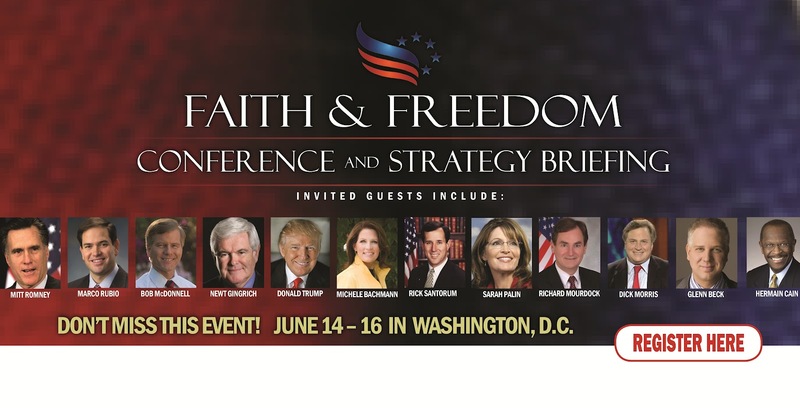 Any respected Christian leader must be compelled to not share the same sacred (its being held at Highpoint Church) stage. The participants, what Beck calls his Black Robe Regiment, may be found here. Highpoint Church, Arlington, Texas For allowing Mormon, Glenn Beck to speak at the Church and for participating in Beck's Restoring Love event. Invited Glenn Beck, a publicly confessing Mormon, to it's national conference. Johathan Cahn, President of Hope of the World ministries, Senior Pastor and Messianic Rabbi of the the Jerusalem Center/ Beth Israel in Wayne, New Jersey. From auction site: "[Y]ou will meet Tim Tebow and have your picture taken with the star quaterback, and then you will have front row seats to Tim Tebow's speaking engagement at Naples Town Hall Distinguished Speakers Series, followed by a three course dinner seated at the Speaker's Table for with Tim Tebow!" From their website: "Regent University is one of the nation's leading academic centers for Christian thought and action, with a multitude of graduate and undergraduate programs available worldwide." 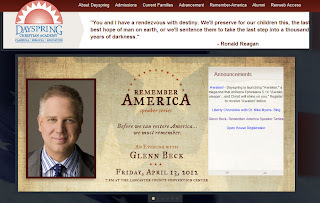 From auction website for MercuryOne: "Scholarship to Regent University Benefitting Mercury One" MercuryOne.org is the charitable arm of Glenn Beck. Regent University is offering a scholarship to their university as part of an auction. 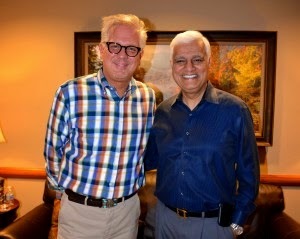 Scholarship to Liberty University benefiting MercuryOne.org, charitable arm of Glenn Beck. Jerry Falwell, Jr. complicit. On Glenn Beck's radio program discussing the National Day of Prayer in the name of the "God of the Bible". Listen to it here. "Glenn Beck is being used by God - mightily"
Skyline Church is a member of the Wesleyan denomination and adheres to the Wesleyan Doctrinal Statement. Founded the Fair Park Bible Fellowship Church in 1987 and serves as its Senior Pastor. Has appeared on Glenn Beck's radio and television programs. Description of donation for Mercuryone.org, charitable arm of Glenn Beck: "This set includes an autographed script of Growing Pains, signed by the entire cast, all three Left Behind movies and an autographed DVD/devotional of Fireproof! http://kirkcameron.com"
Promoting his new movie, Monumental. Nothing wrong promoting one's work, but Mr. Cameron is a well know apologist for Christianity and faith, while not the foremost in the conversation, was discussed. Glenn Beck meets with Cardinals, Monsignors and Archbishops at the Vatican to discuss "the importance of freedom of expression and freedom of conscience, as well as standing against the rise of secularism and the rise of anti-Semitism." This perhaps is okay as long as faith is not the topic. 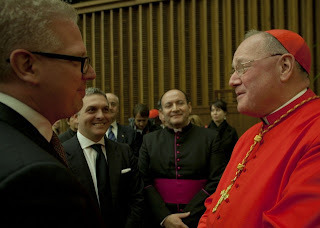 The Vatican is a sovereign nation and meets with various peoples from around the world. However, the meeting may give more credence to the purported claim that Mormons are part of the Christian family. And then I wonder what God would feel about a "prophet" in the Old Testament asking Baal to bring Israel back to its godly roots. I think in such times, he would be stoned. In Deuteronomy 18:20 God says to His people, "But the prophet who presumes to speak a word in my name that I have not commanded him to speak, or who speaks in the name of other gods, that same prophet shall die." Know of more? Send PRT an email. Should you be able to do anything you want with your body? Should you be able to use drugs such as heroin? Should you be able to commit suicide? Should you be able to do perverted things with animals? Should you be able to do perverted things to yourself? Should you be able to do _______ if it "doesn't hurt anybody?" As some of us say to our children, whatever sins you commit alone effect the entire family. Anyone who has been in a family has lived this. A drunk father, a straying mother, a child who cheats in school - the transgressions range from small to great, but each effects not only the individual, but the entire family. Equally, the sins committed on an individual basis in our society effects each of us. When you think you are alone, you are really part of a group - a family, a town, a country. Your actions either add to the structure and fabric of us all or they help to tear us apart. There has been enough tearing down. It is time to build up. We are not an island. Virtue matters even when alone. It's harder than the selfish route, but is something that is desperately needed in our day.